The Oriental cat is a group of felines that all share the same parent breed—the Siamese. It has a sleek and elegant frame and a fiercely people-loving nature. Energetic and very intelligent, this feline is an excellent pet for families who can fulfil its need for companionship. The Oriental has been called the “rainbow cat” as it comes in over 300 colour combinations and markings. It is like the Siamese, but in designer clothing, so to say. Although this feline is not exactly a new breed, it started to be developed as a distinct breed in the 1950s. It was said to have been first bred in the UK, in the years after the importation of Siamese in the country. 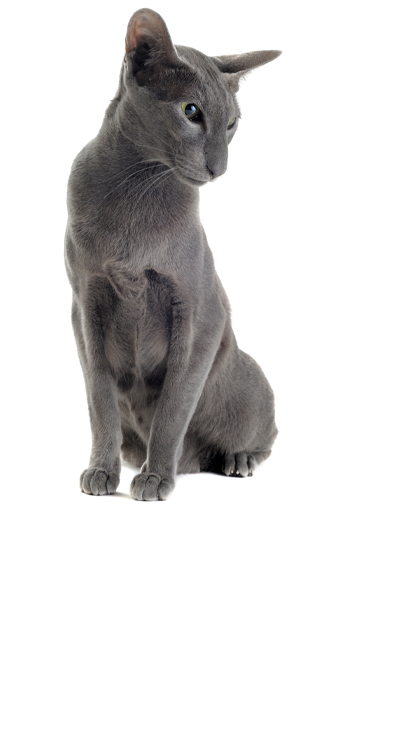 The Siamese was crossed with domestic shorthairs, Abyssinians, and Russian Blues. One of the primary motivations reportedly was the exploration of all possibilities of colour and patterns in the resulting kittens. A number of generations later, some kittens looked very much like the Siamese. However, these kitties had a more varied coat pattern and colour. The long-haired varieties were also later developed after crossing the Oriental with the Balinese. The Oriental cat was later recognised by the CFA and the GCCF. 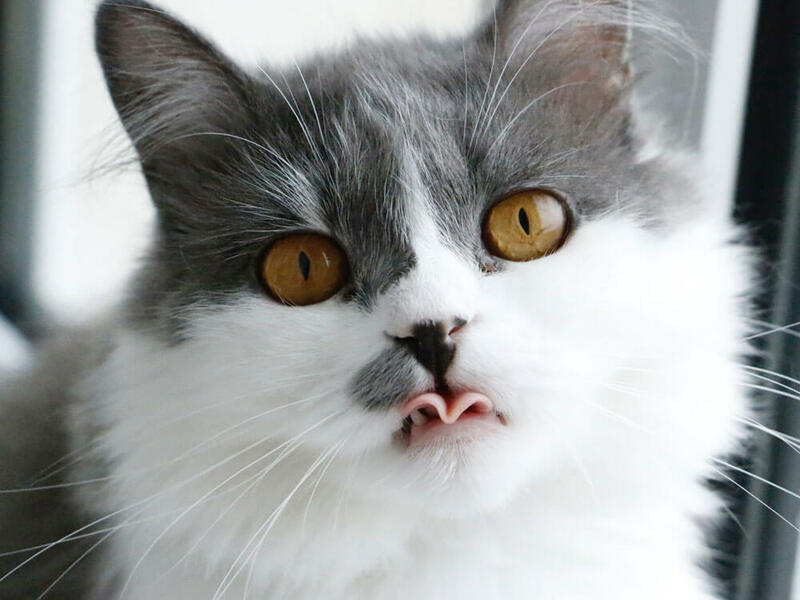 Today, it is one of the most popular cat breeds in the world. The Oriental cat is elegant and may be long-haired or short-haired. Its sleek and slender body can reach about 3 feet in length. Its head is triangular and proportionate to the rest of its frame. It has large, heart-shaped ears and a narrow face. Its eyes are slanted and may be blue or green, depending on the variation. Its slender neck adds to its graceful appearance. This cat’s tail is long and tapering. Its legs are long, slender, and firm, with the well-muscled hind legs being longer than those in the front. Its paws are oval-shaped and small. As for its coat, most have very short and fine fur that lies close to its skin. Some have longer-haired coats as a result of the Birman crossing. The Oriental Longhair cat requires more grooming than the short-haired ones, which are low maintenance. Its coat is silky and glossy, and comes in a wide variety of hues and markings. The Oriental cat personality is people-loving and dog-like. It is full of energy and is highly involved in its family’s activities. It thrives on human companionship and becomes cranky or depressed if left alone. As such, it needs to be in a home that has at least one person left behind to keep it from indulging in separation anxiety. As it can get along with other pets, getting a second animal companion to keep it from being lonely is recommended. As a very social and curious feline, the Oriental is rather talkative and purrs a lot. It likes interactive games and is playful, remaining kitten-like even in the later years of its life. It is capable of doing so as it is very athletic and strong. As the progeny of the intelligent Siamese, this kitty is also very smart and can learn quickly. In fact, it has been called the Border Collie of the cat world. The Oriental cat should be provided a nutritious diet that fulfils its daily requirements. It should be consistently given the same food following the same feeding times. If there are changes to its diet, those must be done gradually to prevent tummy problems. This breed likes to play fetch and can be taught a variety of tasks and tricks. It likes to be kept busy in order to keep its intelligent brain stimulated. On average, the Oriental cat price starts at about £300 for a quality kitten. Average insurance expenses would cost £16 (basic) or £30 (lifetime) monthly. Food costs may range from £15-£20 each month. For vaccinations, boosters, annual checks and other veterinary costs, pet care costs may add up to more than £600 each year. On average, a Himalayan owner will spend about £40-£60 per month. The insurance costs can also affect this estimate. For its entire lifetime (12-15 years), the expenses can be as low as £5,760 to as high as £10,800 overall. This estimate does not include the initial costs incurred in acquiring this cat. Is an Oriental Right for You? The short-haired types are easy to groom. It is a very loyal and people-loving cat that thrives on human companionship. It cannot tolerate being left alone. A second pet can keep it company if nobody is usually left at home. The Oriental cat is rather fond of vocalising. It is very intelligent and energetic—a stimulating companion for families.